Alasdair was happier being a tutor than transacting the sale of his beloved business. He never did quite retire, but he spawned or encouraged a number of fledglings that took wing. John’s book business was one of them and, by accident, mine was another. John started dealing in ‘better books’ in the barn beside our house, while I aimed for a more general bookshop. Alasdair enthusiastically contributed ‘shop stock’ in profusion. John was already working on the sign, which was going to read ‘Atholl Books’, and niftily changed ‘ooks’ to ‘rowse’. The Duke of Atholl snipped our ribbon on April Fool’s Day, 1989, and gently refused my offer of Atholl brose, expressing a preference for gin (and H.E. Bates). I had started the shop with one rule: no textbooks. The second customer came up to me with a psychology text in hand and paid £3 for it. So much for rules. That first spring I purchased 2000 arts and literature books from the Darlington public library – requiring three round trips in our lumbering Daihatsu. Nobody had mentioned to me that most customers don’t like old library books, no matter how interesting; at least 1500 have since wafted off to Rumania via the Blythswood Trust. I still find a few amongst the poetry on occasion. In my ‘day job’ I’m a business consultant: I help large organisations manage and communicate with their people. While I was away at work, local people pitched in to run the bookshop. Sometimes it seemed as if Atholl Browse was being managed by extra-sensory perception. I’d no sooner murmur to myself, ‘The whodunnits are getting low’, than Jean would come in bearing a box of green Penguins. Regular employees meant too much paperwork so I opted for ‘casual’ helpers. Having many different helpers had a randomising effect: notes were pinned around the shop mentioning a book someone wanted or the someone who wanted it (seldom both). Book finding was perhaps not our forte, but we created a pretty good leisure browse, with free coffee, direction finding, ancestor-hunting and local information. ‘Which ones?’ I asked dubiously. He selected about twenty of the fattest, sexiest looking titles. I put them into a special box and by the end of the day they were all gone. A few years later Jimmy fell off his bike and had to move to the old folks home in Aberfeldy, where he faded rather quickly. Atholl Browse’s other unsung hero was my husband John. He wafted from selling books to restoring them in his well-equipped bindery, knocking up an occasional designer binding when he had time. He conceived and built the charming ‘Left Bank’ bargain boxes outside the shop. The red and white striped awning was also his idea, as well as the flourish of potted petunias and pansies and the barrels of wee trees cunningly placed to cover where the petrol pumps used to be. In spring 2003 John and I had a serious discussion. 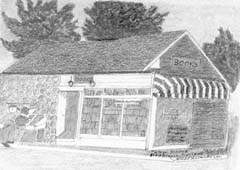 The shop was about to be sold and it was still chock-a-block with myriad autumn ‘investments’- seventy Needlework, forty Fishing and sixty Railway books, all bought just before we closed for the winter. We agreed, ‘No more books!’ That’s when the fun began. Wednesday 26 March: I visit a manse and come away with eight boxes of good Scottish stock. Thursday 27 March: a man who had phoned months earlier comes in with seven boxes of books. I bought the lot. Friday 28 March: take delivery of three boxes of Fishing and Crime I’d forgotten having bought at auction months before. Sunday 30 March: five boxes of saleable leftovers from the scout jumble sale – I don’t have the heart to turn them away. Monday 1 April: Appropriately for April Fools’ Day, we celebrate our anniversary by saying ‘Yes’ to seven boxes of great Railway books, and an hour later to two boxes of paperbacks. Thursday 4 April: the minister and his wife, visited on 26 March arrive bearing six boxes of Penguins discovered in the belfry. We go out to lunch together to celebrate ‘definitely’ the last books through the door! The numerically unchallenged will already have worked out that that’s thirty-eight boxes of ‘no more books’. When John and Mary Herdman took over, I felt like a mother whose only child has just been accepted by a good university. The nest was empty, but I knew the shop couldn’t be in better hands. With more time on my hands, I’ve had fun redistributing my energies: writing more, sewing more, seeing friends. 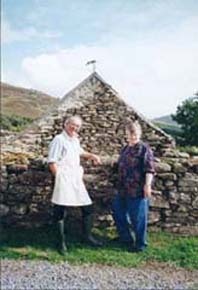 I’m still publishing local and family history as ‘Atholl Publications and selling books – on the internet – as ‘Atholl Fine Books’. That reminds me. I must go and have a look at a few books someone has for sale . . . 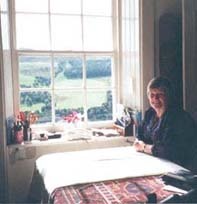 The picture of Atholl Browse shown above was presented to Nancy Cameron in California by the artist Fred Edwards. Copyright Nancy Foy Cameron 2005.